We had a two week break from school and I went back to Sacramento to visit my family and friends at the beginning of the break. I went for a week, and when I got back we went “camping”. “Camping” was my idea. We had every intention of going real camping when I got back from Sacramento but the stars did not align. Brian got sick the day I was headed home and we were going to leave the next day. And there are fires everywhere here in Washington and Oregon. It may come as a surprise to many, but it has not rained here in our area of the greater Portland metro in over 70 days. I know I know, you think it rains here every day. It doesn’t though, it really doesn’t rain much here for months in the summer, and we get to enjoy an Indian summer of sorts most years. It is 70 degrees, sunny, and beautiful days. Cooler Fall changing nights, where the air is crisp and perfect for a thicker blanket. But the lack of rain, and super dry grass everywhere has made it prime for fires, and they are everywhere making camping a no no. So we stayed home, Brian got to rest and recuperate. We ate hot dogs, grilled burgers, and camping foods. But the best part of camping at home, no phones, no computers, no laundry, no chores. We had our bed, our books, peace and quiet. I would much rather be in a forest. But just getting Brian with no homework, work, or computers was enough for me, I am grateful for this time we had together. Pure bliss. See he got a new job, yeah Brian! But it is 40 hours a week, plus his now 6 classes at school, so he can graduate next summer. So I will see him less and our days together are far and few between. So I made this “camping” happen so we can cherish our time together, get on the same page because the next year of our lives may be crazier than the last year. The “camping” ended and we had to go back to normal life, Brian on the computer, and me in the kitchen prepping meals, in the yard mowing lawns, and then blogging about it. I got one day of that last week on Wednesday. Bright and early Thursday morning I woke up super duper major sick. Like the real kind of sick. Not the subconsciousness I don’t want to do anything or go to work sick. I wish. I was sick. I missed school, I never miss school. And today is the first day I feel normal enough to write, let alone edit or read my post. That is why my post is a few days late, I usually post on Mondays. Also I usually catch up on my RSS, comment on other blogs and such. So if I missed a post, and didn’t comment, I am sorry. I had 300 plus posts on my RSS when I got to it. Wow that was way too much reading for my sick self. Needless to say I think my body needed to get that out of the way because I won’t have time for that over the next few months. I need veggies, so I made veggies. It is still warm here, so we are still getting peppers, and beans. But you can add whatever veggies you have on hand or are craving. That is why I love stir fry. I also made some pork after I cooked the veggies. I served this over brown rice. 1. Place all of the sauce ingredients into a bowl and whisk together set aside. 2. Place sesame and grape seed oil in a large skillet or stir fry pan over high heat. Get the pan very hot before adding any veggies. Once the pan is hot, add the carrots and cook for 2 minutes stirring, or tossing frequently. Add the green beans, repeat. Add the broccoli repeat. Add the bell peppers, stir. Then add the soy mixture, stir around veggies, and cook for 3-5 minutes. Remove from heat. 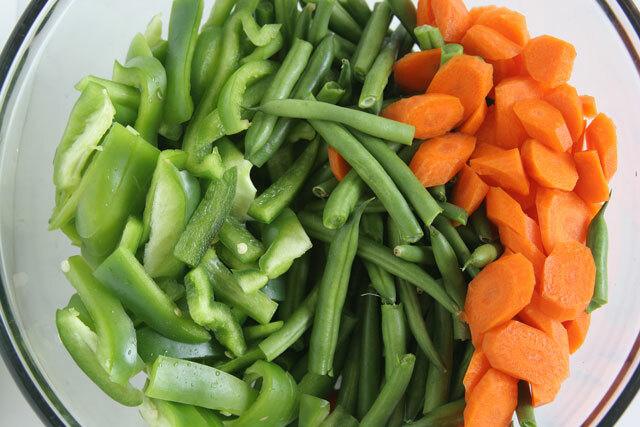 Use a spider or slotted spoon to remove the veggies from the pan. I then pour the remaining sauce into a small bowl to ladle over the veggies when I serve. I served them over brown rice, with a pinch of red pepper flakes, green onions, and a then drizzle of the sauce. Note: The key to a good stir fry is the high heat plus not over cooking the veggies. It is meant to be a quick dish with al dente veggies. 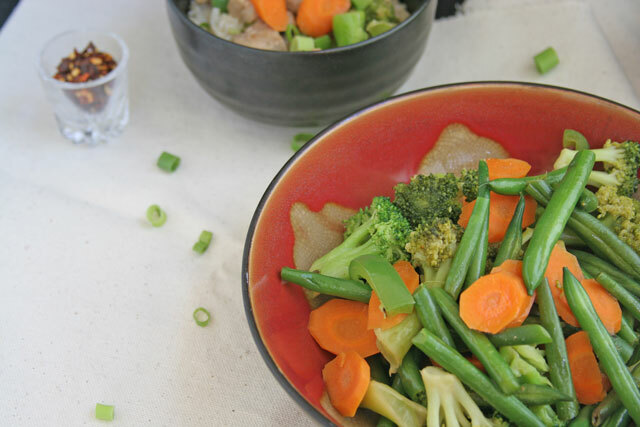 What a great idea to add in a bit of rice vinegar–lovely! Thank you, Kiran! You should totally go next year, I hope we can make it to actual camping next year. But I am going to do “camping” more often, I love not having my phone or computer for a couple of days, it is nice.